Have you ever wished you could get an “at a glance” look at certain types of data without having to navigate through full reports? Now, with easy to customize widgets, you can determine what snapshots of data you would like to see on your dashboard when logging into Enhanced CTLS Assess. Simply click the plus sign under the navigation menu on your dashboard page, title your custom widget page, and then click “add widgets” to select the ones you want. One of the most widely celebrated enhancements to CTLS Assess is the variety and ease of navigation of reports! 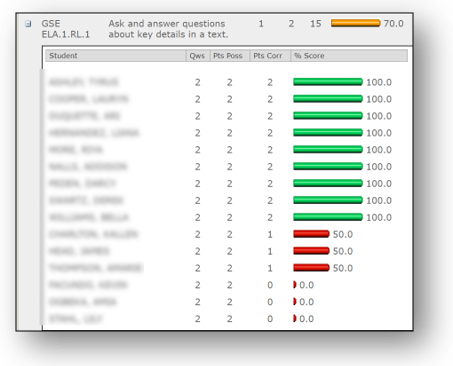 You now have the ability to view reports at the school, teacher, and student level, and most reports are “nested”. This means you can easily drill in for more specific results without having to click in and out of pages to see more or different data. For the past several years, you’ve been learning to “drive” your instruction using CTLS Assess and iRespond. We’ve been monitoring the traffic cams (AKA-your feedback!) and have gathered ideas in order to bring you an enhanced version of CTLS Assess! Newly paved roads will get you to your data more easily, bridges to allow you to bring in your already-created assessments as PDFs, and so much more! Some of our CCSD teachers have been test driving the new model, and we wanted to highlight a few of their favorite enhancements for you. Ability to upload full assessments into CTLS Assess as an external PDF. Ability to compare more than one assessment side by side when viewing data. 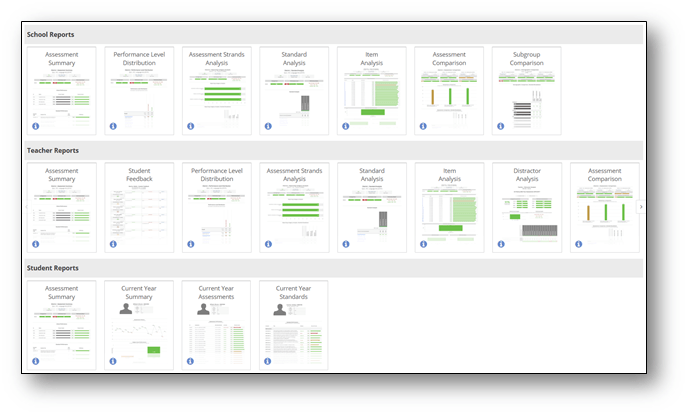 Customizable dashboard including widgets which provide snapshots of data at a glance. Be on the lookout for communication from your local admin and your school’s driving instructor (AKA-TTIS) regarding opportunities for support and training as you begin to navigate these improved roads! Note: Optimal viewing for this video is Google Chrome. Having trouble viewing in your current browser? Try Google Chrome or click HERE to view the Enhanced CTLS Assess promo video! Accessing data in CTLS Assess allows you to plan your instruction accordingly. There is one report, Standards Analysis Report located in the Search Widget that you might find helpful in the next few months as you prepare for EOC Testing. The Standards Analysis Report will allow you to view school year data broken down by standards for a chosen course. Even further, you can view school year data for individual students as well. 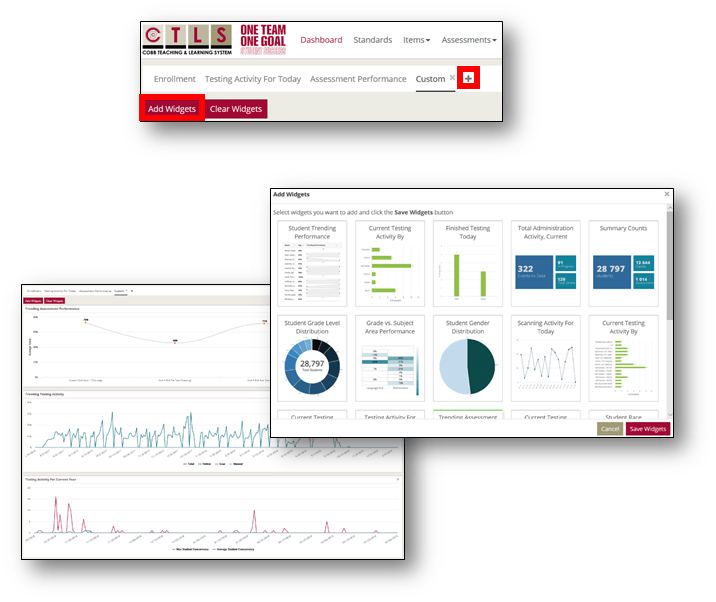 Once you are logged into CTLS Assess, Click on the course you would like to view. You will now be able to view data from all the assessments in CTLS given this year. Click on the + to drill down even further by viewing individual student performance. You can now use the Standards Analysis report to see each student and whether or not a standard has been mastered. Using the data from Standards Analysis report allows you to quickly determine which standards you might need to spend time on when reviewing for an End of Course assessment. Is your iRespond bag collecting dust on a shelf in between required assessments? Many teachers say their biggest frustration with using the remotes is the amount of time it takes to set them up and how often things don’t go as planned. Then there are some classrooms where grabbing an iRespond remote is as natural for students as grabbing a pencil and paper. So, how can you make use of this tool in order to gather information you need without it becoming a hassle or burden? Chances are, you have some sort of routines and procedures established in your classroom whether you teach kindergarten or Chemistry. Those routines and procedures are what help streamline your classroom, save time, organize you and your students, and minimize unnecessary issues. Using ANY type of technology in the classroom effectively will require routines and procedures as well, and iRespond remotes are no different! What are some creative ways colleagues have found to manage remotes in their classroom? Some teachers have found that numbering their remotes and assigning them to specific students helps to both streamline the process of getting remotes in the hands of students, as well as helping to identify remote issues like dying batteries before it’s too late. For storage options, a simple over the door jewelry organizer or shoe organizer works perfectly for easy access and visibility! 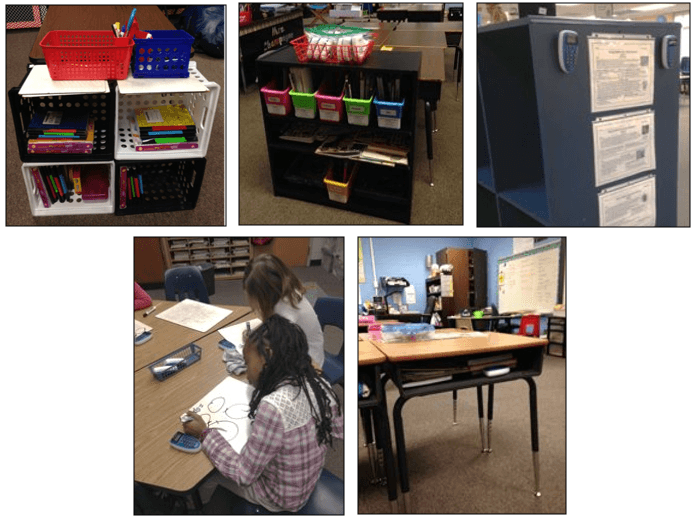 For classrooms with group seating, a basket for the center or end of each table/desk grouping can also put remotes right at the students’ fingertips! You might even consider assigning a remote to each student and have them stored in or on the student’s desk/table. Some teachers have found that using Velcro helps to give the remotes a special spot for each student. Some even have students bring in a special sock that is used to store their personal remote in their desk. Take a look at some pictures from colleagues, and let them spark your imagination of ways you can bring the iRespond remotes in as a more routine part of your classroom! 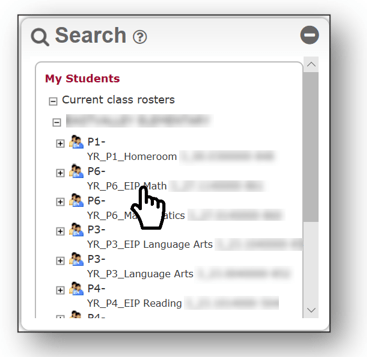 Recently, the iRespond session properties were all reset to unchecked for all teachers for ease of use. If you need clarification on what each session property does, please access the links for the web app and the remote user guides below. Note: When giving district assessments such as SGMs, make sure to refer to those specific directions to guide your session property selections. Scoring Constructed Response is as Easy as 1…2…3! One of the particularly beneficial aspects of assessing with CTLS Assess is the ability to include Constructed Response items! Students have the opportunity to see and practice test items that mirror what they will see on required testing, and teachers have the opportunity to compile meaningful data gathered from a variety of item types. As more and more teacher-created and Touchstone assessments are including CR items, you may find yourself needing a refresher on how to score those items within CTLS Assess. Keep in mind that you can input student scores two different ways. By individual student (which comes in handy when students have taken the assessment using the iRespond Web App, and you need to see the students’ responses on the screen). By the class roster (which is useful when you’ve already scored students’ responses on paper, and simply need to input the points awarded). 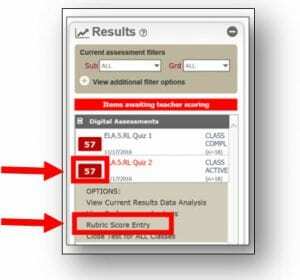 In order to input student scores, you will navigate to the Results widget, click on the score icon, and select “Rubric Score Entry”. For detailed instructions on how to score Constructed Response items, or how to attach a rubric when creating an assessment containing a CR item, click the links below. 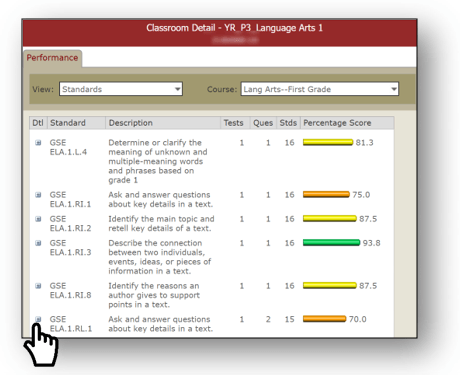 With one of the newest CTLS Assess enhancements, you now have another report option to choose from! 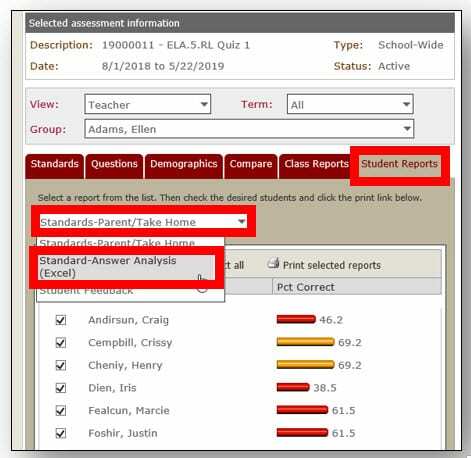 The Standard-Answer Analysis will allow you to see, at a glance, each student’s results for all the questions on a given assessment, along with the standard being assessed by each question. To access the report, click on the Student Reports tab, then click on the dropdown menu and select “Standard-Answer Analysis (Excel)”. You will then generate the report the same way you have in the past. Detailed directions for using the Results widget can be found HERE. Multi-Select questions are now supported in CTLS Assess! You can now create multi-select questions in CTLS Assess. Creating multi-select questions is a great way to prepare students for the Georgia Milestone. The grading for the multi-select questions mimics the grading for the multi-select questions you would find on the Georgia Milestone set by the GA DOE. Go ahead and try out multi-select questions with your students! Click HERE to access the Multi-Select Scoring and Analyzing Scores document. 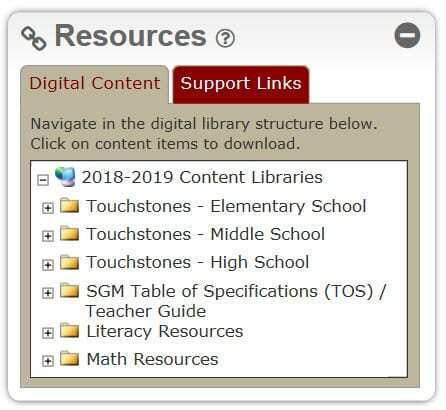 Now that the 2018-2019 school year is underway, it is important that teachers take a moment to locate and review the Touchstone assessments and Blueprints in CTLS Assess. The assessments and blueprints were revised over the summer by teams of teachers alongside the Assessment and Personalized Learning department. After accessing CTLS Assess, locate the Resources widget and drill down into the correct folders for your level, subject/course, etc. There you will find the current assessments and blueprints as PDF documents for you to review changes and additions as well as to print as needed. You will notice the addition of constructed response items on some Touchstone assessments. For assistance with entering constructed response scores, click HERE for directions or contact your local school TTIS for support. If you need additional support with CTLS Assess or iRespond, please contact your local school TTIS. If you have questions specific to the Touchstone assessments or blueprints, have your local school CTLS Assess contact reach out to the Assessment Supervisor for your local school.